ista is one of the world’s leading companies providing energy management services for greater energy efficiency in buildings – especially in apartment buildings and commercial properties. ista helps property managers, home owners and tenants all over the world to meter, visualise and manage individual energy and water consumption. They make individual energy and water consumption transparent. As a basis for this, they use hardware components based on ultramodern radio metering technology. Click here for more information about ista. The mission of Eneco is aimed at providing everyone with energy from 100% renewable sources. Yet at the same time Eneco realises that every customer is an individual. Some people find sustainability important, others attach greater value to a low energy bill. Eneco therefore seeks connection with their customers and helps people and businesses saving energy and thus costs. Each day, Eneco supplies everyone with energy generated from 100% renewable sources. Of all major energy suppliers, Eneco’s investment policy is the greenest. Click here for more information about Eneco. Thermondo is the largest heating engineer in Germany and cares about your heating system. Thanks to the IT developers and heating software, they are able to create suitable heating rates for customers. Thermondo offers a product range of the most traditional, leading heater manufacturers in the market, in order to offer the highest quality to: Buderus, Vaillant, Viessmann, Junkers and Wolf. This allows Thermondo to compare the products of all manufacturers in a neutral way and determine the right price. The heating planner of Thermondo can help to find the most suitable heater for your needs. Click here for more information about Thermondo. 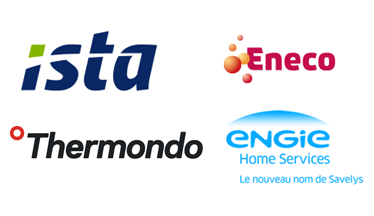 ENGIE Home Services is the number one company in the maintenance and repair of heating systems. If an individual or company needs help, an ENGIE Home Services technician is always nearby and your location within 15 minutes. Engie offers expertise in a comprehensive energy efficient way of service and maintenance of heating, cooling and ventilation systems and they also provide advice. They have been able to adapt and evolve along with existing heating systems. Click here for more information about ENGIE. Interested in the other members of the OpenTherm Association? See the member overview page with al our members.